When a disease dubbed IAAN rampages throughout the United States, killing 98% of kids between the ages of 10 and 18, the children who survive are rounded up and placed in camps. The camps are said to be for their own good, so that they can be rehabilitated, because the children who survived the illness also developed special powers. Some have the power of telekinesis, some can create fire, and others, the most dangerous kind, can get into a person’s head and alter their thoughts. Ruby has spent the last six years of her life at Thurmond, one of the most brutal camps. Instead of rehabilitating or helping the children, the camps are more like prison. They are not allowed to leave, talk to each other except for at bedtime, or contact their families. Ruby has survived this long at Thurmond by hiding her true powers, but when the truth is discovered, Ruby has to escape the camp or she may be killed. When she manages to get out, she realizes that children like herself have more enemies than she thought on the outside, and she joins a group of fellow escapees that are trying to find East River, a place that is rumored to be a safe haven for children with powers. However, not everything is always as it seems. This book was really incredible! From literally page one, I was completely hooked. Ruby is such a frightened girl in the beginning of the book, having hidden her true nature for years not only because she fears discovery but because she fears her own abilities. After the terrible thing that happened to her parents, she is afraid to become close with anyone, especially Liam–the leader of the group of escapees she joins, who she cannot seem to get out of her head. Throughout the book, she grows from a meek and skittish young girl to a strong and confident young woman. What I really admired about Ruby was that after all of the terrible things she had been through in the past six years, she still showed such compassion and empathy towards her new friends and always put their problems and feelings before hers. She realizes that she does not have to let her abilities define her, no matter how dangerous she believes she is. The Darkest Minds reminded me a bit of X-men, since it is about a bunch of people (or in this situation–children) who are hunted down because of their abilities. What I loved about The Darkest Minds also was that we get to see how the United States began to crumble after IAAN terrorized the country. The economy crumbled, the government fell to pieces and basically became a dictatorship, and while many parents hid their children away, others turned them in to the camps. In the next book I would love to find out more about where the disease came from and why it did not kill the 2% of kids that instead developed powers. Overall, The Darkest Minds is a fascinating book with an enthralling story that will literally captivate you from the first page. It is haunting and brutal but absolutely phenomenal. The characters are wonderfully written and the pacing is perfect, especially for such a long book. This book will stay with you long after you read it and leave you desperately longing for the sequel. 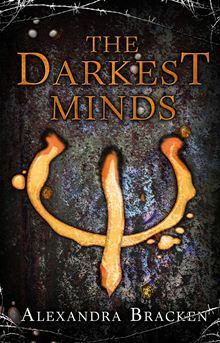 The Darkest Minds was released December 18, 2012 and is the first of a series. The sequel is currently untitled but is expected to be released December 2013.